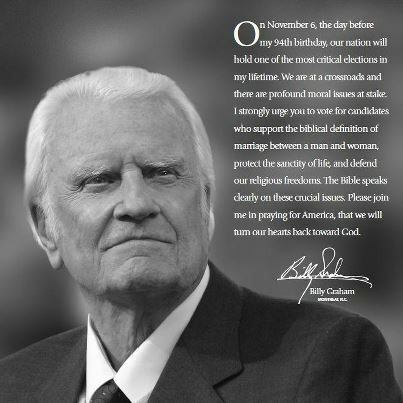 The great evangelist is about to celebrate another birthday, and through the wisdom that is proven from his years of walking with the Lord, Reverend Graham is seeking agreement in prayer for the restoration of our country. Men throughout the millennia have stood in the gap and sought to unite the people of God for the glory of God. Hezekiah, king of Judah, was one such intercessor. He had it in his heart to celebrate Passover, something that had not been done by the entire community for years. He sent couriers throughout Judah and Israel with letters stating: “People of Israel, return to the Lord… Do not be like your parents and your fellow Israelites, who were unfaithful to the Lord… Do not be stiff-necked, as your ancestors were; submit to the Lord. Come to His sanctuary… Serve the Lord your God… for the Lord your God is gracious and compassionate. He will not turn His face from you if you return to Him” (2 Chronicles 30:6- 9). I am amazed at the response of the people! Many assembled in Jerusalem to celebrate Passover. Also in Judah the hand of God was on the people to give them unity of mind to carry out what the king and his officials had ordered, following the word of the Lord (2 Chronicles 30:12). I am not, however, surprised by the response of our God! He “heard Hezekiah and healed the people” (2 Chron. 30:20). What happens next is heart-warming. Although Passover is a 7-day celebration, it spontaneously flowed into a 14-day festival of praise and thanksgiving. Scripture records a great time of joy that had not been seen in Jerusalem since the days of King Solomon! The Israelites demonstrated spiritual revival by adhering to a new holy standard and destroying all the idols and places of worship of false gods throughout Judah, Benjamin, Ephraim and Manasseh (2 Chron. 31:1). They also demonstrated a generosity of spirit when asked by Hezekiah to contribute to the portion due the priests and Levites. The people within Jerusalem along with all in Judah and Israel brought a tithe into the storehouse of God. As soon as the order went out, the Israelites generously gave the first fruits of their grain, new wine, olive oil and honey and all that the fields produced. They brought a great amount, a tithe of everything… and they piled them in heaps (2 Chron. 31:5-6, emphasis added). As a result, storerooms and overseers of all the contributions were established. The intercession of King Hezekiah is again seen in his response to the take-over attempt of Jerusalem by Assyrian King Sennacherib. Hezekiah encouraged the citizens saying, “Be strong and courageous. Do not be afraid or discouraged because the king of Assyria and the vast army with him, for there is a greater power with us than with him. With him is only the arm of flesh, but with us is the Lord our God to help us and to fight our battles” (2 Chron. 32:7-8). He and the prophet Isaiah cried out to the Lord in a critical hour, and the Lord miraculously intervened, sending Sennacherib back to his homeland where he promptly was murdered by his own flesh and blood. Father in heaven, we need You. We are desperate as a nation and turning our hearts to You. We pray that as Hezekiah’s godly leadership produced joy, prosperity and security in the land, that we, too, will be truly blessed by You and all of Your goodness. In Jesus’ Name, Amen. Thanks for adding this post to your blog!